While the celebrity cult of carrying a pampered pooch around in a diamond encrusted bag is well documented, indeed everyday fodder for gossip mags, less widely known is that the handsome hound by a film star or businessman’s side may be far, far more than a much loved pet. He is very likely to be a personal bodyguard. Protection dogs do what it says on the tin. They will protect you and your family from harm. On command (and that is absolutely key) a protection dog will seek out and restrain an attacker. Suspect that a burglar is in your house – send the dog in first to find and secure the intruder. Feel you are being followed – send your dog to bark ferociously at whoever you feel may have wrong intentions. Attacked – on command your faithful companion will attack back. And he won’t let go until you tell him to. Protection dogs are not vicious, they are not unfriendly. On the contrary they are highly trained, super obedient dogs trained to an extremely high level that live with you as your pet. The whole point of a protection dog is that he goes everywhere with you and to do that he has to be immaculately well behaved at all times. These dogs are the canine elite. Well bred and trained by professionals. Protection dog training is not the stuff of the local dog training club, it is a specialised skilled akin to that of training a top level show jumper or a racehorse. If you want a protection dog you get him from the professionals. So who are the professionals? Shaun Tutton and RobDye have recently expanded their UK-based business, Protection Dogs UK, to Dubai. Protection Dogs UAE now supplies protection and security dogs across the region from the Emirates. May i know more details about protection training. 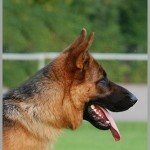 I have a GSD he is fully addvance obediance traind. Please contact the company mentioned in the article directly.